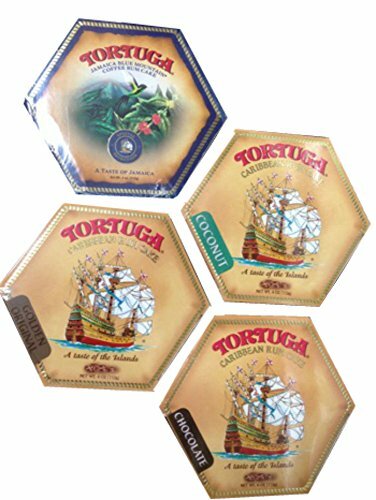 Tortuga Rum Cake Assortment - The popular Tortuga Rum Cake, a favorite of cruise aficionados and Cayman Island visitors, is now available in a delightful assortment! Flavors include Chocolate, Coconut, Blue Mountain Coffee and the Original Tortuga Rum. Cakes will keep six months - longer if refrigerated. The Tortuga Rum Cake assortment is a unique and charming gourmet gift. Flavors include Chocolate, Coconut, Blue Mountain Coffee and the Original Tortuga Rum. 1-2 Servings per cake. Makes an easy dessert for any event. If you have any questions about this product by Tortuga, contact us by completing and submitting the form below. If you are looking for a specif part number, please include it with your message.